Hon. 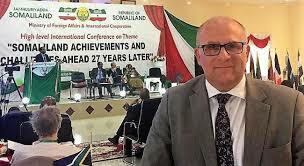 James Carver who is a member of the European Parliament and represents the West midlands area of the UK has called on the people of Somaliland to increase their effort to seek for independence from the international community. The EU MP held an exclusive interview with the Horn Newspaper and Somaliland sun website. Hon. Carver stated that the former Somaliland government strategy for seeking independence was the right one but this time it needs to be overhauled and new strategic plan redrawn to catch up with the changing tides of political waves. The EU representative stated that he does not think that the recently held conference in Hargeisa whose theme was ‘Friends of Somaliland’ will bring any substance in Somaliland wellbeing. 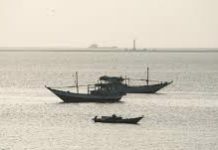 The MP was however skeptical about the military base established in Berbera by the UAE which the former Somaliland president Ahmed Mohammed Mohammud (Silanyo) signed but welcomed the port investment herein is the excerpt from the interview. Q: How do you gauge the recent conference in Hargeisa whereby what the country’s accomplishments were discussed? A: Sincerely speaking the meeting was worthwhile since Somaliland achievements and challenges were put across. But I don’t think such a conference will add any value for Somaliland determination to become an independent state since all the participants were in one way or another supporters of Somaliland. Q: Do you think the 27 years Somaliland has been lobbying to become an independent state has paid dividend? A: I believe Somaliland had a good strategy at the onset but a question lingers in my head has Somaliland improved or made changes to her plan to suit the current changing times. The international community are not stuck to a one Somalia policy but have decided that let the Somalis decide their future through negotiations. They used to say that the UK will be the second country to recognize Somaliland but the first one should be an African country. If the AU supports Somaliland sovereignty the international community will follow suit. In reality it is upon Somalia and Somaliland to reach an amicable agreement to part ways peacefully. 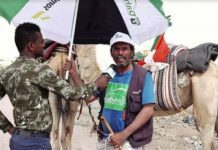 About Somaliland approaching Russia and China for support, I suggest that Somaliland should engage any country that can help it gain recognition. Q: Who amongst the Somaliland presidents over time has achieved much in terms of lobbying for the country’s independence, since you are avid supporter of Somaliland independence? A: Every president encountered different challenges during their reign since all of them used the little resource they had to further the agenda of independence. Q: What role can the EU and the British government play to develop Somaliland’s sociopolitical, security and economy environment? A: I think the British government and the EU will continue to assist Somaliland financially. I don’t think there will be any political movement in the near future.